I took a film class once where we contemplated what kinds of movies could or could not be construed as Westerns. The professor was tall and lanky in a bow tie, with hands that hung down to his knees, a mustache and a ‘power donut’ hairdo. There were some cute girls with dyed hair and tattoos in the class. I don’t remember what we decided about Westerns in the end, but Bring Me The Head of Alfredo Garcia was definitely on the fringes, and I learned to prefer Warren Oates to John Wayne. Anyways, what I took away from the class was the tenuousness of genres, categories- that they are shoddy constructions at best. The same goes for music, of course, and so the soundtrack for an Australian Western starring Mick Jagger, with music written by Shel Silverstein must be approached as its own strange beast. You can’t compare it to Ennio Morricone, or even more contemporary, creepy examples like Nick Cave and Warren Ellis’s work on The Proposition, or Johnny Greenwood’s music for There Will Be Blood. It stands on its own, as an oddball collection of songs written and recorded for an oddball movie. 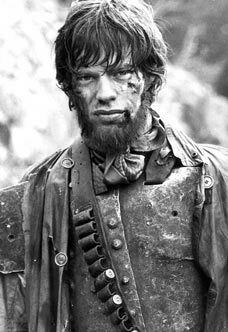 If you listen to the soundtrack to Ned Kelly , you will be disappointed, or at least disoriented, if you hold too tightly to any expectations you hold around Western movies and their soundtracks, to children’s poets, to outlaw country music, to anything really. It’s an exercise in letting go. In addition to all the strangeness that Shel and his stoner crew lend (distorted bass, synthesizers, massive drunken singsongs of “Was your grandma a whore, was your Grandpa a thief..”), the soundtrack features weird film dialog and a performance of the Australian traditional song “Wild Colonial Boy” by Mick Jagger. I don’t understand it, but I like it. Words like ‘good’ or ‘bad’ don’t really apply, it’s kind of like Chinese bubble tea. Great stuff…Shel was the man.